The holiday season is officially upon us. If you’re in the e-commerce space, things are really heating up. According to the National Retail Foundation, holiday spending is expected to increase by 4.8% to $720.9 billion, and every business wants a piece of the (pumpkin) pie. With so much competition, how can you make sure your company’s emails shine through the clutter this holiday season? When is the right time to announce your Black Friday deals or your day-after-Christmas doorbusters? Yes Marketing analyzed over 8 billion emails sent by brands in Q4 of 2017 and compiled all the information into a guide with several key takeaways on email timing. It’s important to note that Yes Marketing defines conversion rate as the ratio of unique email clicks to purchases. 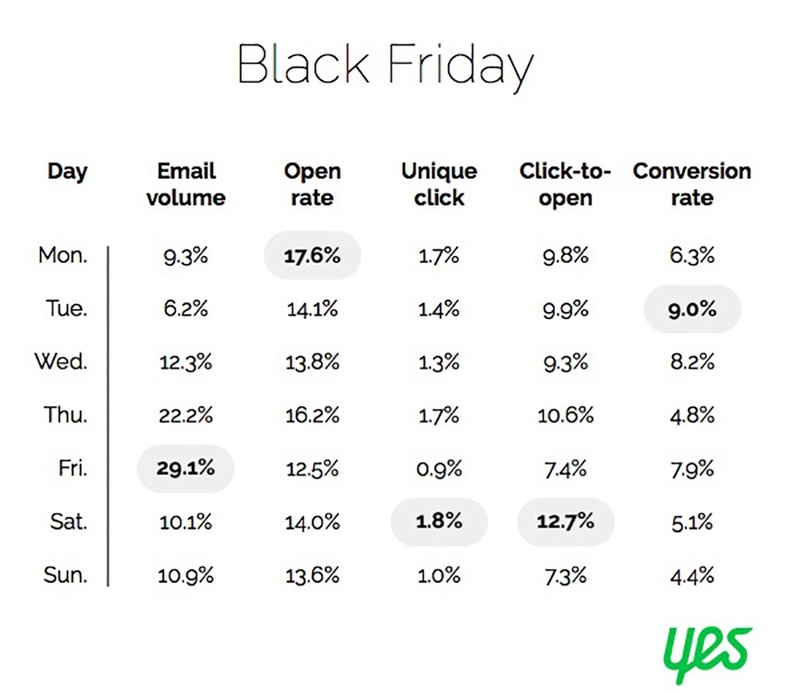 Unsurprisingly, the day of Black Friday had the highest volume of emails, followed by Thursday, Thanksgiving day. Tuesday emails had the highest conversion rate, followed closely by emails sent on Wednesday. Something interesting to note is that Tuesday emails had the smallest volume of emails, yet the highest conversion rate. This rate jumped from 2.5% in 2016 to 9% in 2017. This could be due to consumers excitement over the upcoming deals, or a result of pre-Black Friday deals. Try taking advantage of this trend and send Black Friday emails the Tuesday before. If last year’s trend continues, you’ll have less competition in the inbox and a greater conversion rate. Coming off the heels of Black Friday, the highest volume of Cyber Monday-themed emails are sent on Monday or the Sunday before. 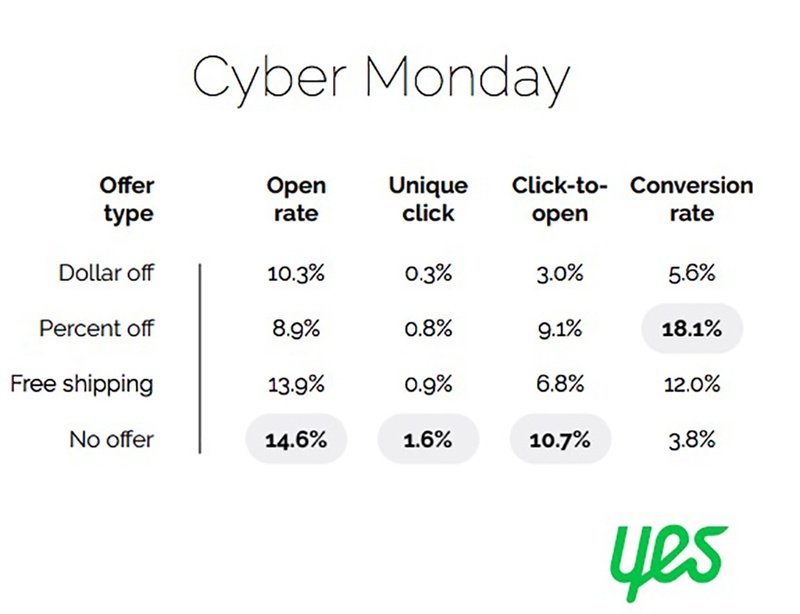 As we might expect, the highest conversion rate aligns with the day of Cyber Monday. The Saturday before Cyber Monday is typically low in email volume, but relatively high in open rate. Though those emails may not directly drive conversions, sending a Saturday email may help generate awareness of your upcoming Cyber Monday sales (thus helping your top line overall). 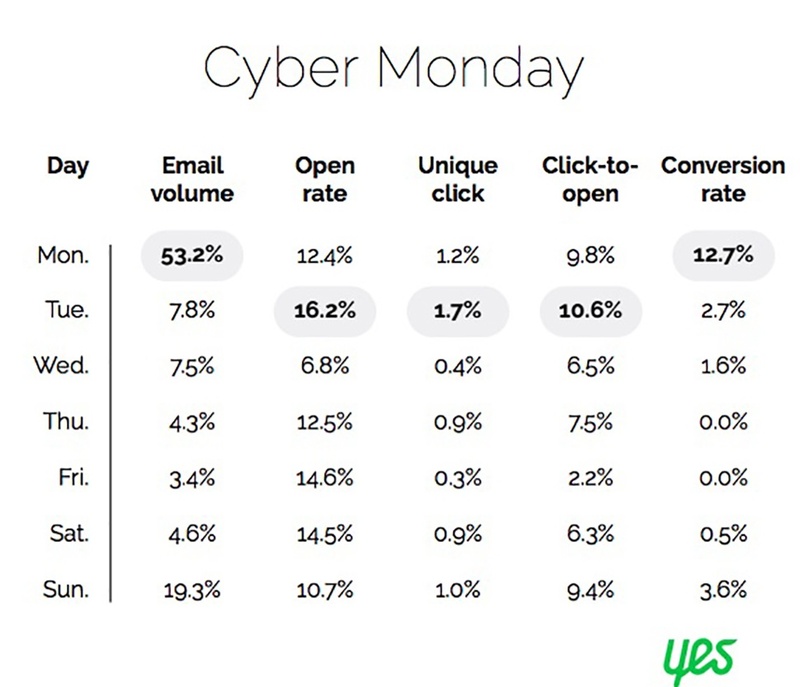 The Tuesday following Cyber Monday had the highest email open rate, unique clicks, and click-to-open rates, but conversion rates were low. This could be due to a post-Black Friday/Cyber Monday purchase fatigue. Tuesday was the most popular day to send emails, but was closely followed by Monday and Thursday. Christmas was on a Monday in 2017, so it is likely that a majority of the Monday emails were well wishes, rather than promotions. Despite the high volume of emails and the highest click-to-open rate, Tuesday emails did not generate much better conversions than Monday emails. According to Yes, most of the Tuesday-before-Christmas emails were notices of the last day to place an order with standard shipping and have it arrive by Christmas. Tuesday after Christmas emails often promoted new sales and ways to spend gift cards. Thursday emails generated the highest conversion rates and performed relatively well across the board. This may be explained by the rise of faster shipping methods, as a reported 63% of consumers expect three-day delivery to be the standard and 83% considering fast shipping to mean delivery within two days or less. That being said, if you are able to offer fast shipping speeds, send out a reminder to that effect on the last day to order for delivery by Christmas! Now that we have some insight into what day of the week is best for emailing, what about the time of day? 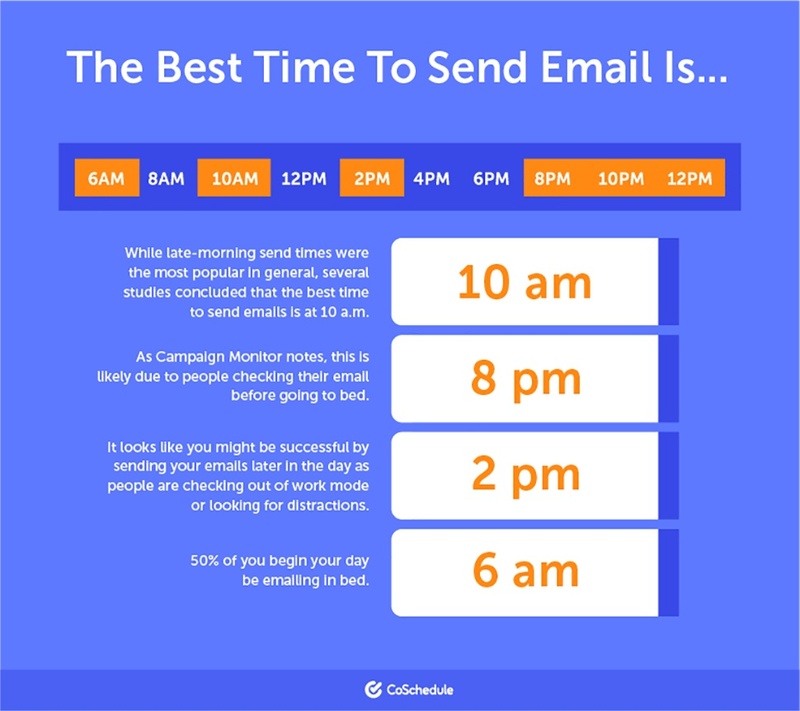 Combining the results of 14 different email studies, CoSchedule found that the optimal time to send an email is at 10 a.m. While helpful advice, the biggest thing to take into consideration when scheduling emails is when your audience tends to open and click your emails. If your email recipients are totally ignoring your 10 a.m. emails, but open-rates are through the roof for emails sent at noon, for example, send your emails at noon! Test different send times and examine your holiday send times from years past to discover what works best. Vary your post times on social media to complement those of your emails. Be sure to maintain standardized, recognizable branding elements throughout all your holiday marketing efforts to give your customers a cohesive, multi-channel experience. Personalized subject lines generated 50% higher open rates, 58% higher click-to-open rates (CTO) and almost 2.5 times the unique click rates of subject lines without personalization. Subject lines between 1 and 20 characters generated a 31% higher open rate than the average. Subject line length impacted open rates most significantly for the retail and technology industries. To get your emails to cut through the clutter, try personalization, emojis, and highlighting promotions. If you have the right tool, personalization is a snap. We use HubSpot, which allows us to easily insert a personalization token into a subject line or email copy. Our favorites are the first name and location options, which allow us to greet our contacts by their name or city. Another quick way to grab users’ attention is to incorporate emojis into your subject line. Emojis increase open rates by as much as 56% and can easily create an emotional connection. Plus, when used as word replacement, they save space! Remember to use emojis strategically. Too many can be distracting, and they should definitely relate to your content. If you’re sending out a Happy Thanksgiving email, for example, don’t throw in a lightning bolt emoji just to try and boost open rates. Given that your content is holiday themed, and there are several holiday-related emojis, it should be easy to stay on topic. Below are the most popular emojis, according to a 2015 analysis conducted by MailChimp. There are hundreds of emojis out there, so get creative and have fun with it! Just make sure to test your emails across multiple email clients and devices before hitting send. No one wants to receive an email with a ⬛️ instead of a 🎄🎁. Subject lines that did not reference a promotion had the highest open rate of 2017 Black Friday emails, but the lowest conversion rate. Free shipping had, by far, the highest conversion rate and the second-best opening rate, falling behind “no offer” emails by only 0.2%. If you are able to include free shipping as part of your Black Friday promotion, consider referencing it in your subject line. Again, we see high open rates for subject lines that do not disclose an offer, but very low conversion rates. “Percent off” subject lines had the lowest open rate, yet had the strongest rate of conversion. This high conversion rate could be a result of deep discounts and the sense of urgency that comes with a one-day sale. Consider emphasizing major discounts and the short time period when writing Cyber Monday subject lines. 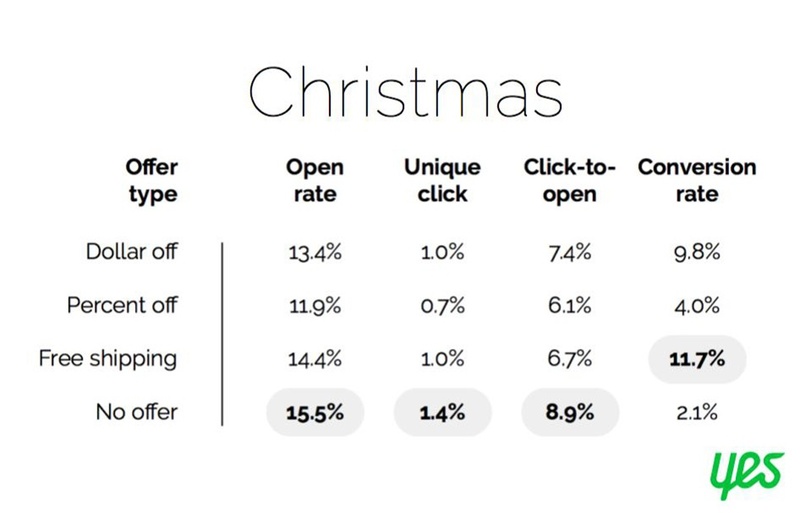 As with Black Friday and Cyber Monday, Christmas emails without an offer in the subject line had the highest open rates and very low conversion rates. 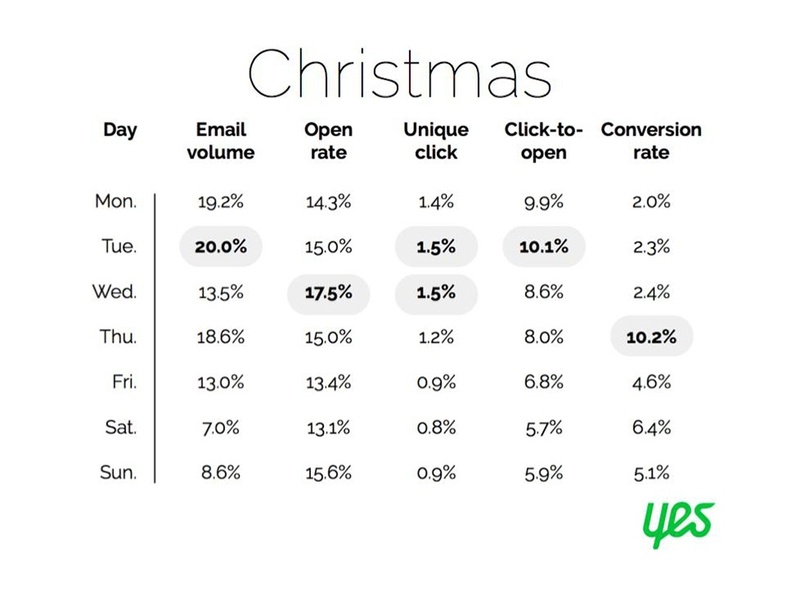 According to Yes, many of the “no offer” Christmas emails had subject lines focusing on content that adds value (rather than drives purchasing behavior), which could explain the unusually low conversion rate. 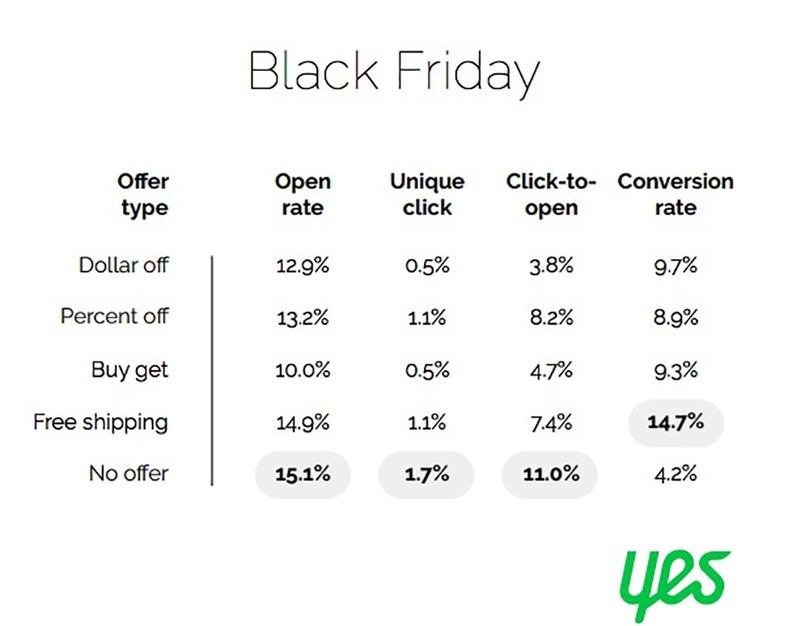 Including free shipping in the subject line resulted in an open rate almost as high as that of the “no offer” emails, and yielded the highest conversion rate. As with Black Friday, it’s a good idea to include free shipping messaging in your Christmas email subject lines. Need some inspiration? Check out these 100 Killer Holiday Email Marketing Subject Lines. You know what they say: Keep it simple, stupid! Consumers are being bombarded with holiday emails this time of year. If they do open yours, you don’t want to overwhelm them with information or too many options. Be respectful of their time and make your emails short and to the point. Keep your templates simple and poster-like. Don’t try to highlight every new and gift-worthy item. Focus on highlighting one key message whether it’s the deal you are offering, well wishes, or helpful holiday hints. Including all three in one email gets hectic and cluttered, and readers may lose interest if your message isn’t immediately clear. If you do have too much going on, consider creating different templates for each type of message or sending different content to specific audiences. Segmenting your email list based on browsing behavior, purchase history, and even demographic information can help you match content designed to educate, convert, or delight with the right recipients. As always, you’ll want to make sure your calls to action (CTAs) stand out. If the email recipient wants to click through to your site, you want it to be as easy as possible. Test the performance of animation or contrasting colors to draw attention to those CTAs. If you need some ideas, we really like these templates from OmniSend. d. When optimizing for send time, use historical performance data or start with 10 a.m. The holidays can be overwhelmingly busy. If you’re in need of a helping hand, reach out to our marketing team today.